I'm so honored to be guested over at Simon Says Stamp Flickr Challenge, today. 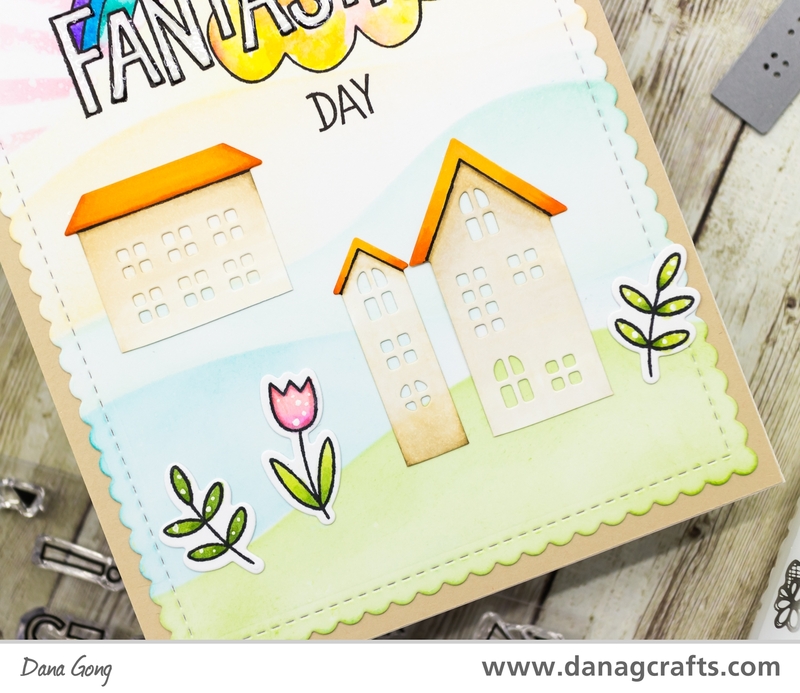 Their current theme is 'Spring time/ Easter theme' and I have two cards to share with you. For my first card, I started by die cutting houses with SSS Village Wafer Dies from white card stock. I cut their bottom line with scissors and drew lines for each roofs. I colored them with Copic markers. I then started to build a spring village scene. I die cut scalloped panel from bristol paper and stenciled hills using Distress Inks. I used Mowed Lawn, Peacock Feather, Cracked Pistachio, Dried Marigold and Squeezed Lemonade. I masked off top stenciled curve and stenciled sun ray with Worn Lipstick Distress Ink. I spritzed water using mini mister and let it dried. Once dried completely, I stamped sentiment image from SSS Amazing Messages with Versafine Onyx Black. I then erased stenciled distress inks inside of images with water brush and clean water. After that, I watercolored image using Zig Clean Color Real Brush Markers. I also applied white gel pen to 'fantastic' and coated them with Nuvo Crystal Drops Morning Dew. 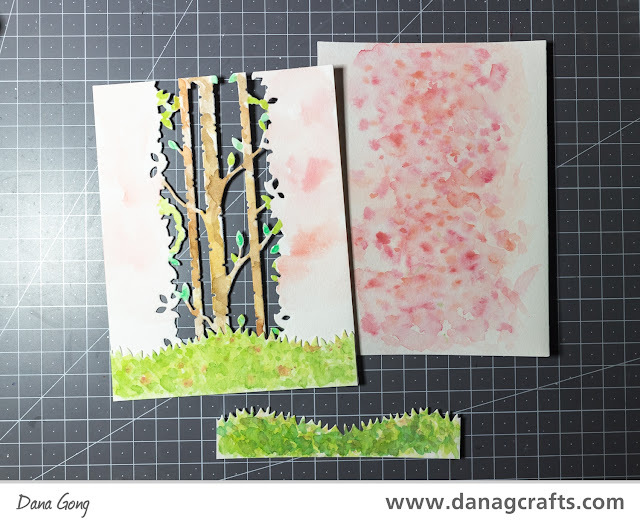 For my second card, I began by die cutting birch trees using SSS Birch Column Wafer Die from A2 sized watercolor paper. For me, spring is cherry blossom season and I created cherry blossom scene by watercoloring. I watercolored birch tree panel and another piece of watercolor paper. I used Mijello Misson Gold Watercolor Paints and Alpha Gold Level Tint Watercolor Paints. I then die cut grasses from same watercolor paper and watercolored them as well. I used both sides of die cut pieces from one die cutting. I stamped giraffe image from SSS Wild Cuddly Critters and watercolored it. After fussy cutting it with scissors, I applied Nuvo Crystal Drops Morning Dew on his eyes and they turned out look like googly eyes. So fun! I then gold heat embossed sentiment from SSS Thoughtful Messages onto vellum and I tore it as shown in the picture. I mounted all layers using glue tape and foam adhesive. I especially glued vellum on the watercolor panel using Ranger Multi Medium Matte behind the alphabet to hide adhesive. I also applied it to left/right sides of vellum slightly, but it's never shown and I love the result. I hope you enjoyed my cards and got some inspirations. Check out more information about Simon Says Stamp Flickr Challenge #93 'Spring time/ Easter theme' in HERE.